Brandon Saddler was struck by a travel trailer six years ago, and today he's telling his story of overcoming and forgiveness. When Brandon Saddler tells people that he died twice, he's used to the responses of confusion and wonder. But it's true. 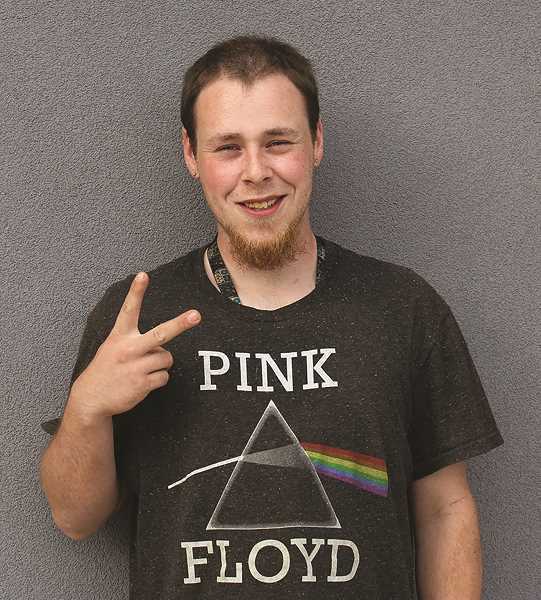 He was a 15-year-old Canby High student, who loved to play drums and video games. But on June 1, 2011, he experienced a literal, unexpected blow. And now he's telling his story. "I was dead on the spot." Saddler was skipping church that day when he put his headphones on and stepped out into the crosswalk on 99E at the Grant Street intersection, obeying the walk signal. Seconds later, he was struck by a travel trailer being pulled by a Dodge truck. "The truck got past me, but I got hit by the travel trailer; so I literally walked in between the truck and the trailer," Saddler said. The driver of the truck was Michael Muessig of Milwaukie, who stopped immediately and cooperated with authorities, according to an Oregonian article from the day of the crash. Saddler heard from friends and family who were at the scene that Muessig's 12-year-old daughter was in the truck with him at the time and that she asked him why he didn't stop at the red light. He reportedly told her that he couldn't stop soon enough because of the weight of the trailer he was pulling. "I was dead on the spot," Saddler said. But inexplicably, that wasn't the end for him. Saddler's own doctor, DeOna Bridgeman, happened to be at the intersection at the time of the crash. An EMT came from across the street. His best friend was in a car at the stoplight. And since Saddler lived only blocks away, his parents arrived in minutes. "The second my accident happened, I had immediate medical care," Saddler said. Bridgeman immediately began performing life-saving measures on Saddler, according to a June 2, 2011 story in the Oregonian by Noelle Crombie. "She threw the car into park and bolted to the boy's aid," Crombie wrote. "He had no pulse and lay motionless on his side, facing the curb. Bridgeman started chest compressions as the boy's distraught mother and onlookers stood by. Paramedics arrived quickly and the teen let out a gasp—a sign that the CPR Bridgeman was performing was working." Bridgeman was later honored by the Red Cross for her heroism. If it weren't for her, Saddler knows he wouldn't be alive today. Saddler was loaded into a Life Flight Network helicopter. He remembers parts of the ride; but he was hallucinating, believing that he was in a military helicopter. That's where he died again, and that's where he came back to life again, though the details of this second event are buried in his multiple 50-pound boxes of medical records. Revived, he was taken to Legacy Emanuel Medical Center, where doctors put him into a medically-induced coma for the first 16 days. It was there that he continued to defy odds. "It's hard for me not to believe in God," Saddler said. "I broke almost all my ribs. They made eight titanium plates to put on each one of my ribs that were broken. They took an X-ray before surgery. Twenty minutes later, six of my eight broken ribs came together and started healing within 20 minutes to the point where they didn't need a plate." The doctors expected Saddler to stay in the hospital for nine months; instead, he stayed for only 43 days after waking from the coma. But despite overcoming tremendous obstacles, Saddler's recovery was more than a bit challenging. He had broken more bones in his body than he could count. He suffered a brain injury with repercussions lasting to present day. Once he came out of the coma, the doctors limited his time with visitors. He didn't know how to respond, except with anger. His family and friends were distraught after Saddler's accident. His father, who had seen some gruesome things as a tow truck driver and military person, described Saddler as being grey when he first saw him. "It mortified him," Saddler said. He continued, "My best friend…it was the only time that he ever ever ever ever ever told me that he loves me." Saddler chuckled. "And I have never let him forget that." But Saddler, watching his loved ones in distress, suppressed his own emotions. The only thing he knew to do, to make it better, was to get better. "I was feeling their pain, and that's why I pushed myself," Saddler said. "That's why I did better. I wasn't feeling my pain because I didn't want it holding me back." Each day during his hospital stay, Saddler participated in at least seven different therapies, including physical therapy, vocational therapy, speech therapy and more. He had to relearn how to walk and talk. His brain had to rewire itself. To this day, he still struggles to verbalize his thoughts. But he experienced some bright spots during his recovery: like gaining an aptitude for science, walking to a pizza place for physical therapy, cooking tacos as vocational therapy and having wheel chair races in the hospital hallways with his friend who has paraplegia. Then, less than two months after the accident and more than $1 million in medical expenses later, Saddler was released to face his new life. But two years passed before he finally started to feel the weight of what had happened to him. "Once it was all said and done, I actually started feeling all this emotion of, wow I died," Saddler said. "There is no one I can talk to about this—feeling this way. I have no way to vent it out." "I cherish people probably more than I used to." He didn't ask for it, but Saddler was a changed man, one who opts to ride a bicycle rather than get behind the wheel of a car and risk putting someone through what he went through. "Whether or not you believe in a god, [this experience] turned me into a better person," Saddler said. "I used to be quite the hooligan. I'll put it that way." He went on, "I cherish people probably more than I used to. I think everyone is special in their own way. I saw what would happen if I disappeared, first-hand. I saw first-hand how it would affect everyone. I wouldn't wish that upon anyone." He also said that his personality is different, and he had to learn how to overcome the anger he felt—especially toward the man who hit him. "Even for a couple years after, I was pretty mad at the guy," Saddler said. But today, if Saddler could say anything to Michael Muessig, it would be this. "I would probably tell him that I forgive him." Saddler paused. "I'm sure that he was affected by it quite a bit as well. It's all in the past to me now."